Zurich, Aug 29 (IANS) FIFA President Gianni Infantino on Tuesday said he reckoned FIFA Under-17 World Cup hosts India have plenty of room to develop their football and awaits a boom in the sport. “Although football has been making considerable strides in the country for years now, there is a unanimous sense that the room for growth is still of gigantic proportions. India is a football boom waiting to happen: it is simply a matter of investing in development — and, more importantly, doing so in a wise and effective manner,” the 47-year-old wrote in FIFA 1904 magazine. With exactly 37 days left for the World Cup to kick-off, Infantino believes India is laying a foundation for revolution of the sport in the country. “Today, as we count down towards the kick-off of the FIFA U-17 World Cup in October, India is fortunate enough to have this youth tournament as a valuable spotlight shining right over its development plan,” Infantino said. “With the ‘Mission 11 Million’, which is taking football to school across the whole country, India has been laying the foundation for a true revolution. A revolution of development and popularisation,” he added. India will make their debut in the FIFA U-17 World Cup. The tournament will be a stepping stone for the young footballers, the President believes. 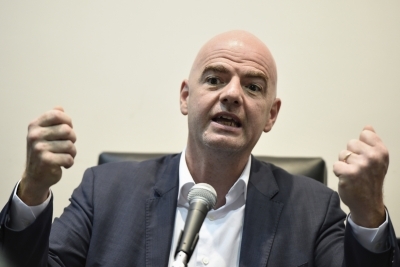 “The FIFA U-17 World Cup is, by its very definition, a stepping stone for young footballers to experience what the global stage feels like,” Infantino explained. India will host 23 nations in the marquee tournament from October 6 to 28.